January is done today and I am glad to say good bye. This month was so busy and super cold. Not sure anything special happen. I am ready to move on. And with January ending come February and Valentine's Day. I love Valentine's Day. In my little world it is about chocolate and all things pink. What is not to like? My New Year's diet is one sweet dessert per week. At least one sweet dessert per week made by me. I might pick up a cookie here and there when I travel but those don't count. Anyway, this week was a delicious Oreo chocolate pie. I was planning on making French Silk pie but then Oreos were on sale and next thing I knew two packages made a home in my cart. I don't typically swoon for pies. Fruit desserts are not my favorite. I remember growing up and begging my parents for French Silk pie at any gathering when we went to The Village Restaurant or Perkins. Remember those? This pie has smooth, rich chocolate filling and made me weak in the knees. And that is before the Oreo crust and homemade whipped cream topping. I seriously could have had the whole thing at once but had to use my strongest will power to walk away. Place Oreo cookies in a food processor and run on high until crushed. Combine in a medium bowl with the melted butter. Press into a 9 inch pie pan. In small microwave safe bowl melt baking chocolate until smooth. Cook for 30 seconds at a time stirring after each interval. Set aside to cool. In the bowl of a stand mixer beat butter and white sugar until fluffy (about 1 to 2 minutes). When melted chocolate is cooled, drizzle it over the butter/sugar mixture. Add 1 teaspoon of vanilla extract. Beat the mixture thoroughly until combined. Switch attachment for the KitchenAid to the whisk. Turn mixer to a medium speed and add one egg at a time, leaving about 5 minutes between each egg addition. This process should take about 20 minutes and in the end the mixture will be light, and fluffy. Once the pie filling is well mixed, pour it into the Oreo crust. Smooth out the pie filling and place pie in the refrigerator to chill for at least two hours (preferably longer). In the bowl of a stand mixer add 1 cup of whipping cream. Carefully turn on and increase speed to medium high. Once the cream starts to thicken, add vanilla and sugar. Continue to beat until thick and the peaks can hold their shape. About 5 minutes in total. Finish the pie with whipped cream and remaining Oreos. Make wonderful homemade pizza with your own pizza dough. It is easier than you think. Mr. J and I eat pizza once a week. Some times we get take out but for the most part we make our own. Homemade pizza is the best. It is a relatively quick meal to throw together and can be as varied and eclectic in flavors as we would like. It is no surprise then that pizza tops the list as a requirement for Game Day eats. Last weekend we made this marvelous pepperoni pizza. Mr. J couldn't believe his eyes when the large pepperoni slices came out of the fridge. He loves pepperoni and I do not. When we share it typically isn't an option. If you are looking to make some pizza this Sunday, check out this pizza dough recipe. It is my go to recipe and never fails. In the base of a stand mixer fitted with a dough hook, combine the flour, yeast, and salt. Turn the machine on low and add 1 cup water and the oil with a slow, steady pour. Turn on medium for about 30 seconds, adding more water, a little at a time, until the mixture forms a ball and pulls away from the sides of the bowl. If it is still dry, add another tablespoon or two of water and process for another 10 seconds. If the dough is too sticky, add flour a tablespoon at a time. Turn the dough onto a floured work surface and knead by hand for a few seconds to form a smooth, round dough ball. Put the dough in a greased bowl and cover with plastic wrap; let rise until the dough doubles in size, 1 to 2 hours. When the dough is doubled, form it into a ball and put on a lightly floured surface, sprinkle the dough with flour, and cover with plastic wrap or a towel. Let rest until they puff slightly, about 20 minutes. Roll into desired shape of pizza and top with your favorite toppings. I need to tell my boss that my trips to wind chill advisory areas needs to stop. Going to one arctic climate to the next has not been fun. I made it to Indiana yesterday. Apparently even at -4 degrees today things are warmer than yesterday. I will be thankful for that. My eats were pretty lame in terms of fanciness but they were satisfying. Chipolte for lunch. Panera for dinner. What did I learned from these little corn dog bites? Everyone needs a little nostalgia in their life. I grew up in Iowa. Each summer we headed to the State Fair for a few days of fun. And although I was never a huge fan of hot dogs I loved corn dogs. They were a must have at the State Fair. I haven't had a corn dog in years but this weekend I knew that was just what I wanted. Some times the simplest things are the best. Mr. J often takes my plans for dinner and tries to turn them into something more elaborate. An additional dish or a more complicated main dish. This can be fun and we have created some really memorable meals this way. However, when he doesn't get the chance to switch things up, we still have some really good meals. These corn dogs were just that. When I laid out this tray on the table for lunch Mr. J's eye's lighted up. Topped with a little mustard and ketchup these were the perfect bites for lunch. No fancy cheese or spices needed. The recipe below is using our favorite cornbread recipe. It is slightly sweet. You can make these though using any cornbread recipe or box mix. Preheat oven to 375 degrees. Whisk together melted butter, yogurt, milk, and eggs until smooth. In a separate bowl, combine cornmeal, flour, sugar, baking soda and salt. Add dry ingredients into wet ingredients in two batches, stirring until just incorporated after each batch. Fill paper-lined muffin tins 3/4 full. Gently place one hot dog piece in the middle of each muffin upright. Bake for 15-18 minutes, or until toothpick inserted into the center comes out clean and the hot dog is slightly crisp. Today is the monthly posting for the Secret Recipe Club. Because of the holidays, our group didn't have a post in December. This was probably a really good thing for me since December flew by. Now that things around our household are back to normal schedules, I am glad to share with you a very fun blog, Fearless Homemaker. There were tons and tons of fantastic recipes to make. In fact the day I started searching was the same day Amy posted her top posts from 2013. I pretty much could have made any of these treats and been happy but using that post felt a bit like cheating. Plus part of the fun is search. After digging around in the archives I found this recipe for chicken, cheddar and wild rice casserole that seemed perfect for dinner on a cold, winter day. Amy must have had the same thoughts since her posting date was the end of January too. This chicken, cheddar and wild rice casserole exceeded our expectations. Mr J. was beyond ecstatic. I never make casseroles. It was warm and gooey with all sorts of cheesy flavor. I liked knowing that it was full of carrots, celery, onions and wild rice. We ate this for days and it never got old. In fact it was pretty sad when the morning came and I realized there was no more left to pack up for lunch. Thanks Amy for such a delicious recipe! Make sure rice is cooked and chicken is shredded. In a large pot or dutch oven heat oil. Saute onion, celery + carrots until softened, about 10 minutes. Stir in garlic and cook for 1 minute. Then add in chicken, prepared rice, salt, pepper + garlic salt. reduce heat to low. Melt butter into a medium saucepan over medium-high heat. Whisk in flour, salt and pepper. Cook for about 3 minutes, until roux turns golden. Slowly pour in chicken broth whisking continuously until thick and nearly boiling. Once thick remove from heat and immediately stir in 2 cups cheddar cheese until melted and smooth. Pour cheese sauce into chicken/rice mixture then transfer to a 9×13 inch baking dish. Top with additional 1 1/2 cups cheddar cheese and panko breadcrumbs. Bake for 25-30 minutes or until cheese is melted, golden. It should be bubbly along the edges. My life is quite exciting these days. Saturday morning we had some one come out to look at our kitchen. Our dishwasher died a few weeks ago. We knew it was old when we bought the house but were hoping it would last another year or two. No luck there. Four months in and it is kaput. This wouldn't be a huge deal just to replace it except for the fact that the floors were built around it. To get the old one out we literally have to tear up half the kitchen. Hello kitchen renovation! I am excited about all of the possibilities but this little big project is about two years too soon. Later in the day someone came out to estimate for extra insulation in the attic. We are a little late in the game this year to be doing such work but better late than never. The dollar amount on that little project was not what we were hoping either. The free project I worked on this weekend was removing wallpaper. We are officially down to one room left. It took several hours and multiple bowls of hot water and soap but the paper is gone. I looked at it one panel at a time and as a game. At the end of the day. I won! Now bring on the paint. I hope you had an equally as productive weekend! Happy Friday!!! I am so happy for the weekend. In fact I was so happy that I one point last night I was thought it was the weekend....only to realize that there was one more day to get through. One more day doesn't seem so bad. Plus I have these muffins. Muffins that were so good two escape before I could get my first photo. These muffins have three full bananas, some whole wheat flour, a touch of cinnamon and browned butter. They were a life saver this week for Mr. J to have a quick breakfast ready to grab and go. I was out of town for a while but managed to pack up to for the best road trip snack I have had in a long time. Now I am home and ready to count down the hours till Friday at 5pm. I am debating right now whether to focus on house stuff or kitchen stuff this weekend. Maybe a bit of both? Preheat oven to 350 degrees and line one 12-cup muffin pan with paper liners. *Brown your butter: add butter to small saucepan and heat over medium-high heat, stirring constantly once it’s melted. Continue heating butter and stirring constantly, until butter foams and then finally turns a rich caramel-brown. Take off heat immediately and let cool until ready to use. Add chopped bananas to a medium microwaveable safe bowl and microwave for 3-5 minutes or until soft. Set aside. Whisk together milk and egg in a small bowl. Once butter is cool, stir into milk and egg mixture. Combine both flours, brown sugar, cinnamon, baking powder and salt in a large bowl. Pour wet ingredient mixture over flour mixture and stir with large wooden spoon until a few streaks of flour remain. Stir in bananas. Fill cupcake liners 3/4 way full with muffin mixture (I use an ice cream scoop to measure, you could use a heaping 1/4 cup as well) and bake at 350 degrees for 16-19 minutes or until a toothpick inserted in center comes out with only a few moist crumbs attached. The three choices were seafood lasagna, a veggie pot pie and white chocolate mousse with Frangelico. They all sounded really delicious but I was most intrigued with the veggie pot pie. The recipe had NO peas and ricotta. I hate peas and love ricotta so it seemed like the perfect fit. The recipe itself was a bit time consuming and definitely not a quick week night meal. This makes sense since the Silver Palate Good Times Cookbook is all about special entertaining. I wasn't doing any entertaining but took Saturday afternoon to whip up this warm, filling comfort food. The veggie pot pie was good and all the flavors worked well together, especially the hint of lemon. What got me a little confused though was the Italian flare with a pot pie feel. I didn't feel like I was eating Italian but all the flavors were there. Just a bit off with the buttery crust but hard to articulate. If you want to become a part of the cookbook club read this post and click for the Facebook group. Come join us in the fun! Finely chop the spinach. Melt 1 tablespoon of the butter in a large skillet over low heat. Add the spinach and cook uncovered until the liquid evaporates and the spinach is dry, about 10 minutes. Remove to a bowl. Sauté the mushrooms in the remaining 1 tablespoon butter in the same skillet over low heat until the moisture evaporates, about 10 minutes. Remove to a separate bowl. Blanch the tomatoes in boiling water for 1 minute. Plunge into cold water. Peel and seed the tomatoes. Finely chop the pulp and place in a sieve. Combine 3 of the eggs, the ricotta, half the dill, the basil, parsley, nutmeg, salt, pepper, lemon juice and zest, and Parmesan in a large mixing bowl. Roll out half of the pie dough on a lightly floured surface and line a deep 2-quart baking dish with the pastry. Spoon half of the ricotta mixture into the dish. Place half the spinach over the ricotta and sprinkle with some of the remaining 3 tablespoons dill. Spread half the mushrooms over the spinach and sprinkle again with dill. Top with half of the tomatoes. Repeat the vegetable layers and cover with the remaining ricotta mixture. Mix the remaining egg and the water in a small bowl. Brush the edge of the pastry with the egg wash. Roll out the remaining dough and place over the dish. Trim the pastry and crimp the edges together. Cut steam vents in the pastry and brush with the egg wash.
Bake until golden brown, about 1 hour. Serve immediately. Hello lovelies! I am in Syracuse this week and it is very, very cold. In fact about -25 wind chill this morning. Brrr!!! Sometimes I don't pack appropriately. This is one of those times. I have plenty of clothes and winter gear but my shoe choices. Not so good. My feet have been pretty cold. Breakfast was my usual Hampton Inn breakfast. Warm oatmeal topped with cranberries, nuts and some raisin bran cereal. Lunch was a quick one at Olive Garden. The unlimited soup, salad, and breadsticks was too much to pass up on a frigid day. I hope you are staying warm and safe. We will be heading back later and are going to be meeting lots of snow. Have you heard of the Da Vinci Code? I have to think most people have. It was recommended to me way before the movie was even in discussion. I read the mystery novel and enjoyed it. Just a nice little story for entertainment. When I heard a new novel was coming out some time ago I planned to pick it up. Of course this is one of the books that you can start and finish within a day or two and costs upwards of $25 for the hard cover when it is first released. I don't spend that kind of money on books. Well fast forward a few months...maybe more and it was waiting for me on the popular books table at the local library. I quickly snatched it up for free. Libraries are the best! 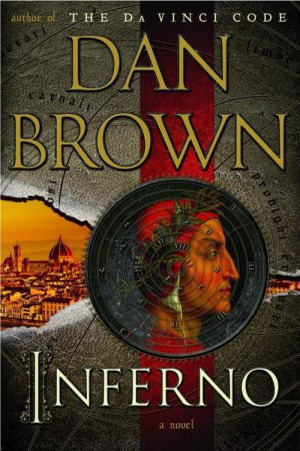 Like Da Vinci Code, the key character, Robert Langdon, finds himself in the midst of a mystery.Unexpectedly he wakes up in an Italian hospital with a bullet wound and no memory of the last few days. He needs his strong knowledge of symbols and history to figure why someone might be after him. This story was intriguing to me because of the futuristic possibilities of science and what that can mean to the future of human kind. Although still a bit out there for me it was a much more realistic story than some of his other Langdon novels. With the cold weather and freak snow storm that suddenly can a possibility this morning I need another good book. Any suggestions? Happy Monday!! I do wish you a happy Monday but I would really like it to be the weekend again. Lucky all of you who have today off. I am off on another whirl wind week. Plus did you hear it is suppose to get cold again. I am not looking forward to that. I am prepping myself with all sorts of warm, comfort foods to get ready. This baked ravioli is full of all things warm and comforting. Soft cheese ravioli pillows, tossed in homemade sauce and topped with all sorts of cheese. Note to future self: if the pan seems too full it probably is. We had a bit of spillage in the oven with this one. This little casserole (can you even call it that?) didn't last long. As in after we had our first helping we immediately went back for more. The recipe below has you making your own quick red sauce but feel free to substitute a jarred version if crunch for time. Heat oil in a large saucepan over medium heat. Add onion and garlic, and season with salt and pepper; cook, stirring occasionally, until softened, about 5 minutes. Add thyme and tomatoes. Bring to a boil, reduce heat, and simmer, breaking up tomatoes with spoon, until sauce is thickened and reduced to about 5 1/2 cups, 20 to 25 minutes. Meanwhile, cook ravioli in a large pot of boiling salted water just until they float to the top (pasta will continue to cook in oven). Drain pasta; return to pot. Toss sauce with pasta. Pour pasta into a large gratin dish or 9-by-13-inch baking dish, and sprinkle with cheeses. Bake until golden, 20 to 25 minutes. Cool slightly before serving.